Earthquakes strike with no notice. They have the ability to rupture waterlines, make roads impassable, knock out power, and leave you wholly reliant on the supplies that you have on hand. Depending on the strength of the earthquake, you may have to sustain yourself for days before the government will be able to help you. 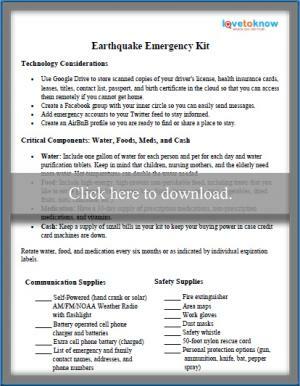 Preparing your earthquake emergency kit now can help to ensure that you have the basic survival essentials in place to be self-reliant. A combination of both high and low-tech emergency kit options will provide you with the best mix to make the best out of a bad situation. 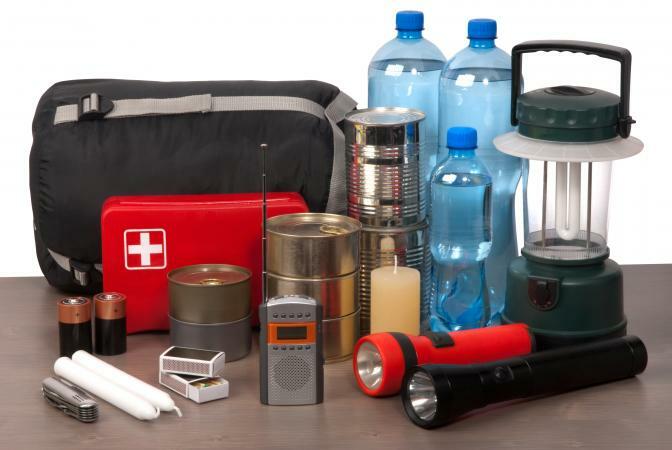 The rule of thumb is to have enough supplies to last three days as part of your earthquake preparedness plans. Use Google Drive to store scanned copies of your driver's license, health insurance cards, leases, titles, contact list, passport, and birth certificate in the cloud so that you can access them remotely if you cannot get home. Create a Facebook group with your inner circle so you can easily send messages. Add emergency accounts to your Twitter feed to stay informed. Create an AirBnB proﬁle so you are ready to ﬁnd or share a place to stay. Water: Include one gallon of water for each person and pet for each day and water purification tablets. Keep in mind that children, nursing mothers, and the elderly need more water. Hot temperatures can double the water needed. Food: Include high-energy, high-protein non-perishable food, including treats that you like to eat (e.g., granola bars, protein bars, Spam, beans, soup, tuna, vegetables, dried fruits, nuts, chocolate, etc.). Medication: Have a 30-day supply of prescription medications, non-prescription medications, and vitamins. Cash: Keep a supply of small bills in your kit to keep your buying power in case credit card machines are down. Rotate water, food, and medication every six months or as indicated by individual expiration labels. Chances are you have many of the items listed above in your home. For a printable version of the list, click the image at the top of the article. Gather the items to start building your kit and check them off as you go.